This week, I had the pleasure of interviewing Hannah Onstad, freelance content strategist at H2O Content Strategy and founder of LOAKL, an online platform for finding books across local, independent bookstores. In this interview, Hannah talks about how local bookstores play an important role in our communities. 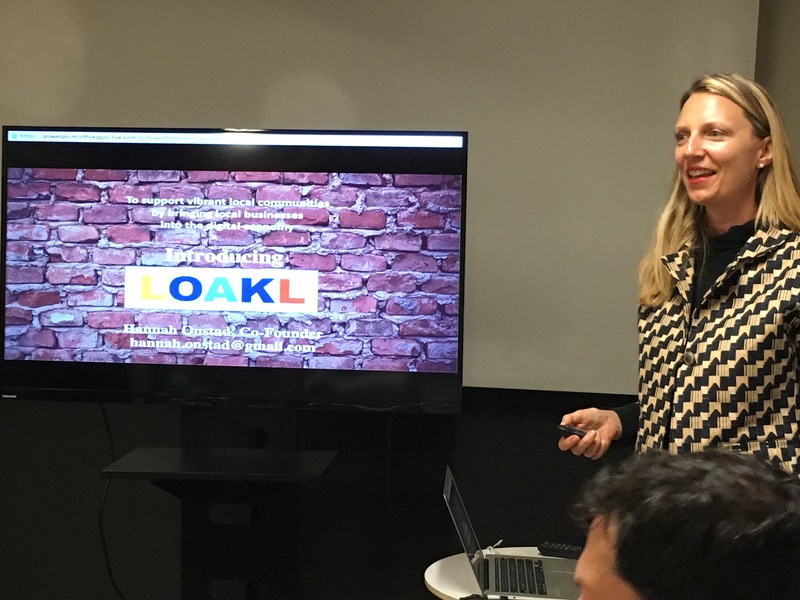 She shares her vision about how the LOAKL platform can support bookstores and other retailers. And, she shares tips on how she leverages her freelancer business to create financial sustainability while maintaining the flexibility to be able to grow the LOAKL platform. How did you get into both of these businesses? My background is in publishing. But even before that, I go back to my experiences as a kid and young adult. One experience was reading with my mom. My mom and I would read Charlotte’s Web and Stuart Little. We read all the E.B. White books. She would take me to Garden State News – it wasn’t even a bookstore really, but more like a glorified newsstand, where I was growing up. She would get lost in the aisles, and I would sit and read Mad Magazines and Agatha Christie novels. I found that to be a lot of fun. And as I got older and I traveled in my 20s, I found myself rummaging through bookstores in new cities and towns when traveling. I’m really a culture junkie. Going into these bookstores, I can get lost for days. So I became interested in publishing. I worked in publishing for years in different capacities, including leading editorial teams and marketing teams and developing media projects. H2O Content Strategy, which is my freelance gig, is a natural extension of the work I’ve done in publishing. Also, during my time in publishing, I had a seed of an idea about LOAKL, wanting to figure out how to help independent bookstores thrive. My first job in publishing was as a public relations assistant, where I would book author tours. I would frequently call independent bookstores and book readings for authors. I came to appreciate the value that small bookstores have in a community in terms of creating community space. More recently, local bookstores have been fending off whatever the latest development is – whether it is the infiltration and expansion of chain bookstores, like Borders and Barnes & Noble, into their territories or the massive push toward eReaders and eBooks. Yet, they survive because I think they are close to many people’s hearts. You mentioned that local bookstores are near to people’s hearts. What do they represent in our communities? I think that local bookstores provide something that is very personal and that goes beyond just the commerce of books. Because these are places where we can explore ideas, be exposed to new authors, and new concepts, they provide people with the opportunities to learn a lot about the world outside of where they live. Over time, these bookstores become important icons in the neighborhood. I remember when Cody’s Books in Berkeley closed – what an institution that was! Almost a decade later, people are still talking about Cody’s Books. They remember that corner, that space, because they spent a lot of time there that was meaningful. And so, as real estate prices go up and everything feels like it’s getting more commodified, we need to think about the value these businesses provide beyond just an opportunity for commerce. LOAKL is currently a minimum viable product (MVP), which means the platform is in its very early stages of functionality. You can go to the website site to find a book – you type in some basic details about the book you are looking for and whether you want to pick it up or have it delivered. Once we locate a copy, we send an email back with some information on how to purchase the book, and then it’s ready for pick up at the local bookstore, or we arrange for delivery. Some of the bookstores we work with are: Laurel Book Store, Diesel Bookstore (now East Bay Booksellers), Pegasus, Mrs Dalloways, Owl & Company, Marcus Books, Bibliomania, Walden Pond, Moe’s, among others. We deliver value to those bookstores by providing them with a sale while giving the customer the convenience of online shopping and finding the book locally. How did it feel to get your MVP out there? It was a great thrill. I had been kicking around the idea for a while. Also, while I had been freelancing, I was asked by the editor of Alternet to do a review of The Local Economy Solution, a book by Michael Schuman. In doing that review, I realized that the idea for LOAKL is what Schuman termed “a pollinator enterprise,” a business that spreads the best of what other local businesses offer creating an entrepreneurial ecosystem. That helped me to frame the idea that I had been thinking about around how to support other businesses. And then when I took the first module of Uptima’s Small Business & Enterprise Accelerator, I did the market research, got out, and talked to potential customers to find out about their book buying habits and reading habits. This gave me the confidence to quickly build an MVP. And, I was surprised how smoothly that went. I wasn’t thinking about the long-term plans for LOAKL at that point. I was trying to think about how to get through just building the MVP for a test. And, when did you get your first customer? My first customer was my mentor in that class. He was my very first customer and managed to buy a book from a local bookstore through LOAKL and pick it up at the local bookstore. It was a great thrill to see the system and process work. Since then, how has that process evolved? Well, the beauty of building the MVP and not having any particular attachment to an outcome meant I got to learn from every customer interaction. I found so many anomalies in how the process works, and now I’ve seen those anomalies being replicated. So, I know the types of things that can happen or the challenges with specific types of requests. That’s been a wonderful learning experience in terms of having that research and data before building a full product. At what point, did you start to attract customers you didn’t previously know? I think it was about 4-6 months from our first order. The first marketing effort I did was at the Oakland Indie Awards last year where I had a table. People signed up to be on the mailing list, and most of those people are still on our mailing list. And this year, LOAKL was nominated for an Oakland Indie Award. How does that feel? It’s kind of mind-boggling because just last year I remember supporting Uptima and seeing Uptima on stage. I thought… well, I can’t imagine getting there. I didn’t think it was possible in a year’s time to find myself in a similar position. It’s been a thrill. There’s so many great companies that have been nominated. We’re just lucky to be in the running. In addition, LOAKL is a finalist for an Idea Café Small Business Grant. How has that process been for you? The Idea Café Small Business Grant was something I applied for on a whim, thinking again nothing will happen with this. And, low and behold, we’re a Top 10 Finalist in this nationwide competition. And we could use a few more votes to help us win before the voting period closes on May 18. When I first learned that we were a semi-finalist, I felt a little insecure about asking people to vote. But as I got over it, it’s been great to see so many people support LOAKL. Tell me a little bit about the insecurity around asking people and how you got over that. I don’t know exactly if it’s a personal thing. I had this mindset that I should be able to handle it and do everything myself. But when starting up, I came to realize that people are so important to the growth of the business and that people are willing to help. I’m often willing to help when people ask something specific that I know I can assist with. But, it’s asking that’s sometimes challenging. I remember having this conversation with my current Uptima mentor about getting out there and promoting the grant. As I did it more, I got better at it. Also, I realize that our interconnectivity requires both giving and receiving. You can’t just give. And, you can’t just receive. It’s a dynamic process that we’re all in. Wouldn’t you say that our interconnectivity is at the heart of how the local economy works, including how LOAKL works within the local economy? Yes, exactly. It’s a good analogy. Personally, I found that switching a lot of my buying behavior means that I am way more connected to the people I’m buying goods and services from. And, that just feels better. Knowing where our money goes and who benefits is a very conscious way of spending money. In the past, I know I spent money with chain stores and focused on what’s available and didn’t really think too much about the process. LOAKL is all about how we shift our buying dollars and put them back into the community to support those businesses that we frequent. If we want our communities to have bookstores, cafés, and local shops, we really have to make sure we’re investing our buying power with them and not just doing the simple click thing. How do you see LOAKL evolving over the next couple of years? On the bookstore front, I can certainly see expanding. We’re very lucky in the Bay Area because we have so many amazing independent bookstores. I’d like to see us supporting all the Northern California independent bookstores. And in the future, I see ways that LOAKL can provide a service that none of them can provide on their own and still support them. That could be expanding into audio books and eBooks in addition to print books, and bundling them together for optimal user experience. And if this model works with bookstores, I can easily see it working with other categories of goods, including office supplies and art supplies. We’re lucky to have a lot of experience in that we have retailers who have been around for decades, like Kerry’s Office Supplies and Flax. These businesses bring a lot of value and experience to the area, and I’d like to see them continue to do that. Also in the near-term, we want to see local Oakland Unified School District and charter schools contributing to their own cause by buying local. Right now, many of them are buying from distant, online, big chain retailers that have little connection to our community. If they were to redirect more of those purchasing dollars locally, which LOAKL will help them do, they stand to benefit because local businesses pay more property taxes as well as sales tax that in turn supports schools, roads, and other infrastructure we need. In addition, many of these local small business leaders give back to local schools by supporting them with donations, events, and other things. So, it’s in our schools’ best interest to help the local business community. And, I want to help facilitate that and make it a priority for local schools. How were you able to get both your freelancer business and LOAKL off the ground? Uptima was a big part of that. I remember our first meeting. I had just been laid off from a job and was trying to figure out what I wanted to do next. When I came to meet with you, I remember saying I wasn’t sure if I want to be in the freelancer program – I had an idea for a content strategy business (but I didn’t quite call it that) and at the same time, I had an idea for a startup. You asked, “Why don’t you try both?” And, I thought that’s a great idea and wondered why didn’t I think of that. So, the idea was to get the freelance business up and going and then to begin putting feelers out and developing the startup business. I feel lucky to have this freelance work that is sustaining me while I continue to develop LOAKL. The freelance work and LOAKL dovetail nicely in that they are related to things that I love – media creation and books. On the content strategy side, I have a number of clients, some of whom I found through Impact HUB Oakland and my work with Uptima, and I’ve done a variety of different things, including building websites, creating eLearning materials, and creating eBooks. That generally has been my primary source of income while developing LOAKL. I collaborate often with Iva Koberg, a digital strategist, who has a company called windsandwater.com. And, LOAKL has been generating interest and also we’re increasing the number of customers we’re reaching, but it’s not yet sustainable as a business by itself. How do you balance your freelancer work with the development of LOAKL? It’s been organic. And, I appreciate that. I go where the need is in terms of my projects. Sometimes I get busier with content strategy projects, and then when I have a little bit of downtime in my freelance work, I focus on building LOAKL. They haven’t been in conflict, so that’s been fortunate. What has been your biggest challenge in building your business? And how are you approaching this challenge? Mostly not knowing. Being comfortable with the unknown. I think when I’m doing certain tasks for the business, like building the business plan, looking at the business model, and doing financial forecasting, I want to be accurate. Because there isn’t a lot of history, it’s been challenging for me to know what’s real, what’s wishful thinking, and what’s a true projection. As time passes, I know I’ll eventually get more historical data. Also, moving into operating a business, I spend some time focused on the long-term and the future, but spend a lot more of my time on the day to day and what needs to happen now. And every now and again, I pull time aside to assess. I match the two up and see where I stand. How often do you assess the performance of your business? I would like to be doing this quarterly, but right now, my process is to check in a couple of times a year. And at the end of the year, I take a little more time to do a very sober look at what happened. Since LOAKL has now been in business for over a year, I now have some historical data, which enables me to see patterns a little more clearly. With growth, you never know. But, the more data you have, the better you can make estimates. In the past, you also expressed to me that marketing has been a challenge. Is that still a big challenge? I have because I’ve had unrealistic ideas around growth. And yet, if I dig back to my own roots in publishing, I worked for a small press, Peachpit in Berkeley, where we typically grew very organically and felt that was the right way to go. I learned a lot from that experience. I feel like LOAKL will grow the same way – by word of mouth. Initially, I may have thought I had to triple sales, month after month, to be on the right growth trajectory. But the reality is marketing to people who have never heard of LOAKL and have no context for it doesn’t result in the same success as word of mouth and natural growth among people who are exposed to it. The connection is stronger with people who understand more about the business, hear from a friend, or hear from me personally at a marketing event in the community. They are more likely to follow through on their order and tell their friends about their experience. That feels more natural than target marketing through search engines or email. Where do you think your expectations around growth came from? The ridiculous amounts of venture capital that have fueled the growth of so many technology startups. I feel like when there’s that much money to play with, I think people are just focused increasing the number of eyeballs, pageviews, time on task, etc. A lot of that activity is artificially driven to capture our attention unwittingly. Those methods are opposed to finding people who genuinely want my products or services. What has been the most fun thing about building a business? Not having a 9-to-5 job. After years and years of doing that, being able to orchestrate my day as I see fit and have more autonomy and control over my life has been the greatest thing for me. My proudest moment has to do with customer feedback. When I hear from customers that LOAKL resonates with them and they are interested in this as an alternative to use, I feel like I’m on the right path. It’s not just me who wants something like this. There are people out there, who I don’t even know, who are encouraging me. And, that’s pretty awesome. What advice do you have for someone who is starting out? Sometimes I talk with people who are thinking about starting a business, and I tell them that it’s really helpful to have a community, a support network and a framework. I benefitted from the framework Uptima provided because the process was laid out step by step, and I was able to follow that. Had I completely gone on my own, I might have stumbled around and done some of these things, but probably not as quickly and as methodically as I was able to having gone through Uptima. So, I’ve recommended Uptima to a lot of people. But, whatever your process is, everyone can benefit from the wisdom of people who have done this before, seek them out. This has been a journey where I can’t rely on everything that I’ve learned in the past. I really am charting new territory. You can find out more about Hannah’s freelance content strategy work at H2O Content Strategy. You can find books at your favorite local, independent bookstore via the LOAKL platform. Or drop by LOAKL’s booth at the Oakland Indie Awards or Oakland Book Festival in May, or the Bay Area Book Festival in June.